Looking for quality lawn care to keep lawn healthy in Leander, TX? GoMow offers affordable lawn mowing and lawn care services to Leander homeowners. Get a quick FREE QUOTE for lawn maintenance. Residential Lawn Mowing in Leander, "You Click,We Cut"
Yes, we are mowing your street! GoMow is honored to offer lawn care and lawn mowing services to Leander residents. Click here www.gomow.com to select from one of the many different Lawn Maintenance Service Plans available to the residents of Leander and have your lawn today! 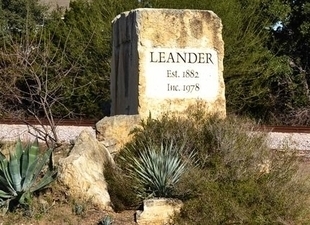 Leander, located in Travis County and 22 miles north of Austin, is the fourth fastest-growing city in the state. According to the 2016 census, the population is roughly around 38,000 residents and is growing daily. Along with that exponential growth, are the many residents that are looking for quality lawn care to keep their lawns looking healthy and great year-round. At GoMow, we are committed to servicing the residents of Leander with their various lawn service needs. We offer affordable lawn mowing and lawn care services that today’s homeowners are seeking. Contact www.gomow.com to help you get set up on an ongoing Lawn Maintenance and Lawn Treatment service plan in Leander today. I was able to arrange work to clear my beds of grass/weeds and they also trimmed some bushes. They can do so much in 30 minutes to an hour with two guys! It would have taken me 4-5 hours and I know it wouldn't have looked as good. Thank you for the amazing compliment! I've used Go Mow for over a year now. I am very pleased with their service. It's so nice to come home to a freshly mown lawn, and they also use the weed-eater along the fenceline. When I have needed extra flower bed work done, they are very responsive to calls or e-mails. They have never missed a scheduled visit. Leaf and leaves clean up and leaf removal near Cimarron Golf Country Club. Near Greatwood Estates, perform Lawn Mowing service and hedge trimming. The house is located near Gateway Shopping center that is looking for affordable lawn care and mowing service. The landscape in the front needs to be trimmed back with hedge trimmers. Yard work and mowing around Lakeline blvd. Trim around the front hedges and clean out the flower beds. Residential lawn on bi weekly service. Near the Gateway Shopping center in the center of town. Recommend fall leaf removal and to trim the unruly bushes. Provide the best lawn care and mowing service in the Hill Country area. Located in the Blockhouse Creek area, provide lawn cutting and lawn service for the home owner. The overhang of the bushes in the back need some attention from our crew on the next lawn service visit. HEB Plus is close to the customer address that wants affordable lawn care. Inspect the bushes in the front yard beds for insects and recommend mowing the turf higher. Near Cimarron Hills Golf and Country Club. Perform residential Lawn mowing service for the customer and expert recommendation of how to manage the leaves that are building up. Near HEB Center at Cedar Park and the address is around the corner. Lawn mowing and weekly lawn maintenance in both the front and backyards. Keep the new grass trimmed lower for proper drainage.